South Sudan's President Salva Kiir and former rebel leader Riek Machar signed a peace deal past year that calls on them to form a unity government on May 12. The pope read remarks in which he said that while God's gaze was on them, "there is another gaze directed to you: is the gaze of your people, and it expresses their ardent desire for justice, reconciliation and peace". "Resolve your problems", Francis said in improvised remarks. 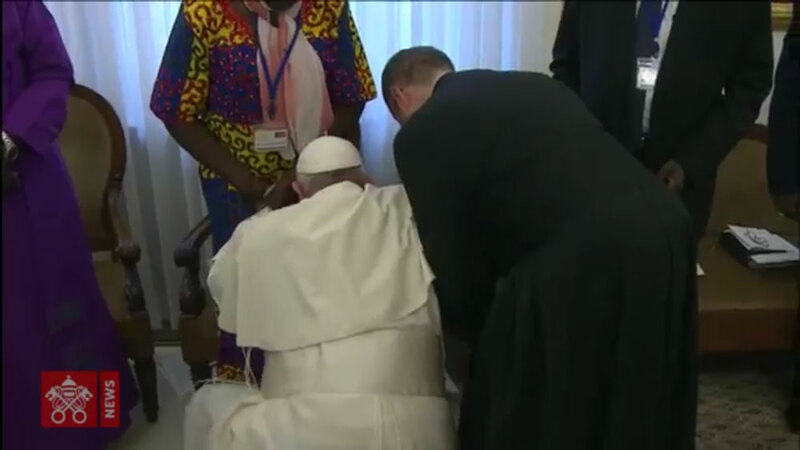 Pope Francis kneels to kiss the feet of South Sudan's President Salva Kiir Mayardit, at the Vatican, Thursday, April 11, 2019. The pontiff who spoke in Italian - which was translated by an aide into English - added that "but in front of the people, hold hands united". This way, the pope said, that they can "become fathers of the nation". The arch-rivals last saw each other in October past year, shortly after the signing of a power-sharing deal, when Machar made a brief return to Juba for the first time since fleeing on foot in a hail of gunfire in July 2016. Several ceasefire agreements and peace pacts have failed to end the fighting, which has led to the death of an estimated 380,000 people, uprooted a third of the population, forced almost two-and-a-half million into exile, and triggered bouts of deadly starvation. Following the military takeover in Sudan, concerns are being heard that the fragile peace might be in peril. "People are wearied, exhausted by past conflicts: Remember that with war, all is lost!" the Pope said. Pope Francis told the gathering: "Peace was the very first word that the Lord spoke". He also repeated his wish to visit the country along with other religious leaders to solidify the peace.